In this article, Hardik Singhvi discusses the new trend in direct to patient selling by pharmaceutical companies, in order to reduce wastage and move manufacturers nearer to where the patients are, saving costs. Over the years, pharmaceutical companies have been selling their products through pre-wholesalers and regional wholesalers, because of the local expertise needed in order to gain market reach. With the consolidation of wholesalers, emerged giants such as Alliance Boots, Celesio and Phoenix, have started expanding their presence across Europe through mergers and acquisitions. The wholesalers have also started to integrate vertically through pharmacy chains, which have increased their bargaining power against manufacturers. Pharmaceutical companies then started engaging 3PLs as their pre-wholesalers in certain countries, but the problem about wholesaler’s bargaining power still remains. Recently the ‘Direct to Pharmacy’ (DTP) model by Pfizer and GSK emerged, which delivered products directly to pharmacies, bypassing the wholesalers completely. The DTP model thus received protest from wholesalers and was then restricted to limited products. The latest trend in pharmaceutical distribution is ‘Direct to Patient’. Biogen distributes Avonex1 directly to patients in Germany through Arvato healthcare and in April 2012, AstraZeneca announced distribution of its cancer drug Arimidex2 through Express Script at rate of US $40 per month. Patients can download the application form and submit it along with the prescription to AstraZeneca. The product will then be delivered to the patients within 5 to 7 days. The direct to patients channel will increase the supply chain visibility for manufacturers, reduce wastage, reduce pharmaceutical product returns and enable manufacturers to move closer to the patients. In Europe, this channel will reduce the problem of parallel imports. The direct to patients channel will also help pharmaceutical manufacturers to regain their share from generics. For example, according to a Reuters report, Arimidex reported sales of $880 million in the United States in 2009 ($1.9 billion globally), which fell to $42 million in 2011. “Arimidex Direct” will help AstraZeneca gain its volumetric market share from generics, as patients can obtain a month’s supply for $40 – lower than those available at drug stores. The price of Arimidex at medsearchonline is $173.10 per month and generic anastrozole is priced at $58.20 per month. This will provide a great sigh of relief to elderly patients who are not covered by insurance to obtain their dose at affordable price. 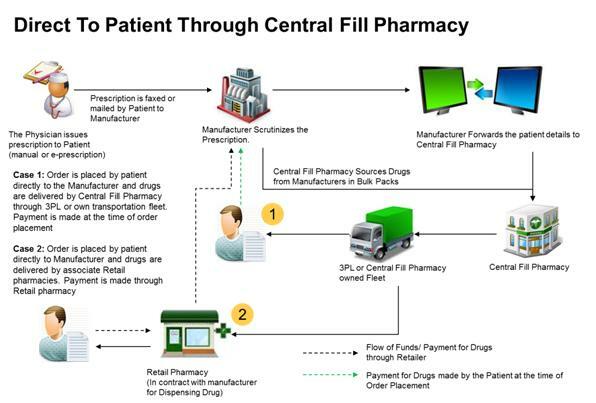 Companies like Express Script, CVS Pharmacy and McKesson in the United States, Mediq and Brocacef in Netherlands, ApoDos in Sweden and Blisterzentrum in Germany all offer multiple medication through ‘central fill pharmacy’’ These central fill pharmacies can be engaged by manufacturers for direct to patient distribution of their drugs for long term illness. Currently, the cost of Arimidex has to be paid by the patients and is not covered under insurance schemes, due to the availability of generics. This may reduce the patient’s impulse to purchase through direct to patients. However, the direct to patient model can bring benefits to manufacturing companies in countries such as India. “There are no regulatory bottlenecks to this model and it is feasible in long run provided manufacturers agree to share the patient information and pay for the packaging service which is currently paid by the retail pharmacies. However, currently the best way of delivery in Netherlands is through retail pharmacy”. 1. They are licensed to procure drugs through wholesalers and directly from manufacturers in bulk packages. 2. They are Good Distribution Practices (GDP) and Good Storage Practices (GSP) compliant. 3. They have labeling and packaging equipment, which can be used for postponement services. Thus repackaging and labeling of products can be moved further down the supply chain. This might prove effective in European Union where the language and labeling policies differ across countries. 4. They also provide final mile delivery either through regional logistics service providers or through own fleet. Hence, pharmaceutical manufacturers can bring visibility, cost reductions and enhanced customer service through adoption of a direct to patients channel for delivery of long term illness drugs. Will this put a cap on increasing wholesaler bargaining power? Will the success of direct to patients channel provide an area of opportunity for wholesalers and 3PLs? Will this lead to diversification of role of central fill pharmacy as direct to patient channel and fulfilment centre for online drugs (mainly OTC)? All these remain questions to be explored. 1. Avonex: Avonex is a drug manufactured by Biogen for treatment of relapsing forms of multiple sclerosis. 2. Arimidex: Arimidex is a drug manufactures by AstraZeneca used in the treatment of breast cancer. Hardik Singhvi is a Senior Research Analyst of Pharmaceutical Distribution with Beroe-Inc. He has conducted extensive research on distribution strategy for pharmaceutical products manufactured in Europe and benchmarking in-market distribution practices for pharmaceutical products in India, South Africa, Brazil, Morocco and Italy. Also, has studied alternate pharmaceutical distribution models such as multiple medication distribution. He can be reached at hardik.singhvi@beroe-inc.com or found on LinkedIn here. Will the direct to patients channel provide an area of opportunity for wholesalers?